Home About News & Press Dr. Duane Berquist, R.I.P. A longtime friend of the College, Dr. Duane Berquist passed away this afternoon with family at his side. Dr. Berquist was the brother of College co-founder Marcus R. Berquist and the father of an alumna, Maria (Caughron ’93). 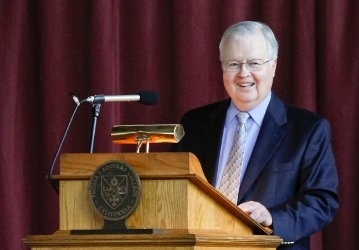 He taught many Thomas Aquinas College faculty members in graduate school and he lectured on campus numerous times over the years, most recently giving the St. Thomas Day Lecture in 2014. Please pray for the repose of Dr. Berquist’s soul and the consolation of his family, especially his wife, Rosalie.